Repairing a toilet seal is rather simple and can be easily done with some basic, household supplies. Broken or loose toilet seals are among the most common causes of a leaky toilet. The toilet seal in most contemporary toilets is present in the form of a ring-shaped seal that has an adjustable collar for tighter installation. This seal is needed for preventing the leakage of water and sewer gases that can pollute the bathroom space. You can use the following guidelines for repairing your toilet seal in an affordable and undemanding manner. Get started by preparing yourself with a pair of rubber gloves. Turn-off the shut-off valve or the main valve that controls the water supply of the toilet. This valve is usually located in the wall upon which the cistern of the toilet is secured. Flush the toilet repeatedly to ensure that any remaining water is also drained-away. Now, proceed towards the base of the toilet, i.e. where the toilet is secured upon the bathroom floor. Use a flat-headed screwdriver to edge-out the ring of putty or caulk. This can be tedious since the toilet base is tightly packed at the time of installing the toilet. Use the tip of a screwdriver to open the plastic caps present on each side of the toilet’s base. 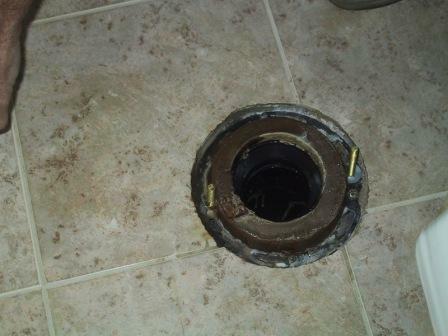 Below the caps, you will find metal bolts that secure the toilet bowl upon the floor. Loosen these bolts with a wrench and remove them. It is better to seek the help of another person at this time for holding and lifting the toilet bowl. Many times, toilet bowl isn’t properly secured over its base and loosening the flange might cause it to suddenly fall-off. Ask the helping individual to slowly tilt the toilet bowl. This might also cause a small splurge of any water that was retained with the exit hole of the toilet along with traces of grime that can stain the bathroom floor. Thus, spread some old rags around the toilet’s base before attempting to tilt the toilet bowl. This should reveal the flange bolt with the accompanying nuts. The flange is a durable fitting, needed for securing the toilet bowl onto the underlying drain hole. Flanges are of different materials, including cast iron, metal and plastic. Metal flanges are difficult-to-handle since they can be corroded. Use sharp end of a screwdriver to scrape away the rust. Use a wrench to loosen the nut and remove the bolt. It is better not to remove the toilet bowl as re-adjusting it might become difficult. Ask you associate to keep the toilet bowl tilted as you quickly proceed with the repair. Using a putty knife edge-out the old wax ring. Replace it with the new wax ring. The wax ring seal should fit tightly. New wax rings tend to protrude a bit which could impair the tight fitting. Thus, repeatedly press down upon the seal. Now proceed towards inserting the flange bolts. Use a wrench for tightening the bolts. Ask your associate to gently position the toilet bowl in its original position. Doing this with a jerk can crack the underlying ceramic tiles of bathroom floor. Insert the metal bolts to secure the toilet bowl upon the floor and tighten them with a wrench. Replace the plastic caps you had removed at the start of the project. You can apply a thin bead of putty or caulk around the base of the toilet for a tighter fitting.